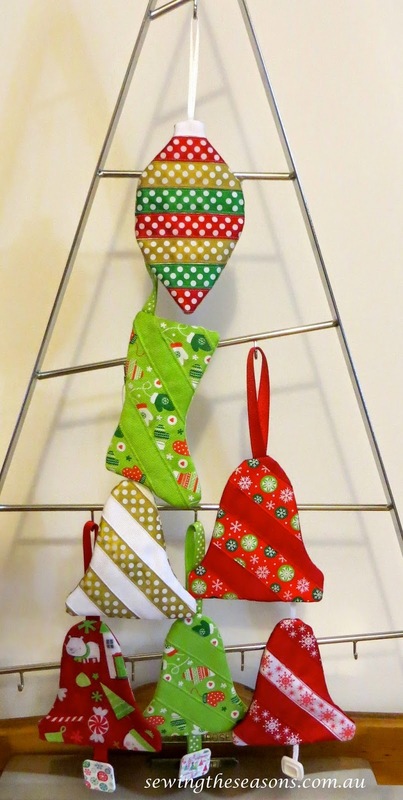 Today's tutorial shows how easy it is to make stunning Christmas decorations using ribbons. 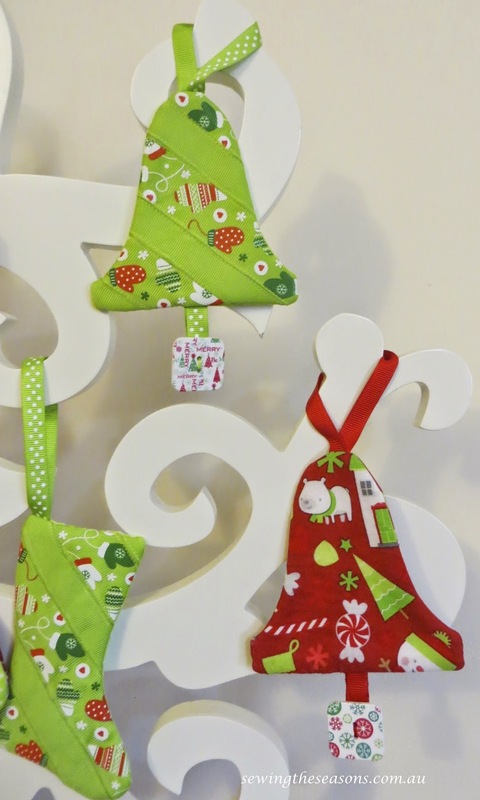 This is an ideal project to use up some of your wadding & fabric scraps as well. Choose your shapes - there are so many options, draw your own, look in colouring books, or google Christmas shapes in images & find some free downloads. Choose a variety of ribbons for your shapes. The patterned grossgrain I used in my first designs came in my Sew Box Subscriptions Nov Box, the patterned satin ribbons came from my local Spotlight. The plain grossgrain I had on hand. Cut strips of ribbon & place on fabric/wadding base ready to attach. Sew ribbon onto fabric/wadding base piece - I used a normal stitch but you could choose a fancy stitch if you wanted. Place ribbon piece right sides together with backing piece. Pin on pattern piece and cut out. Remove pins & pattern piece, set backing piece aside for a moment. Cut small piece of narrow ribbon for hanging loop. Stitch this securely to decoration shape. 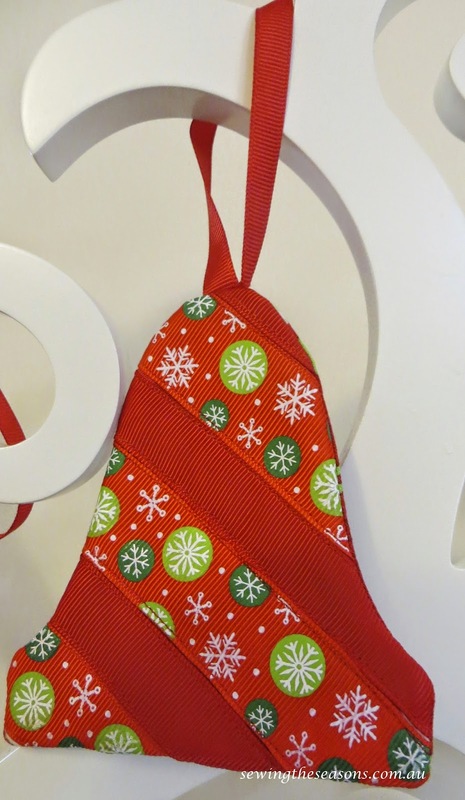 If adding button at base of bell, also add small strip of ribbon ready for button. Repin backing piece right sides together with ribbon front piece & stitch around with a 1/4" seam. Leave a gap for turning through. Look for the 'straightest' part of your shape for this gap. Clip curves & cut off the corners. Turn through, push out corners carefully with preferred implement. Pin gap closed & slip stitch gap. Audition buttons for bell shape. 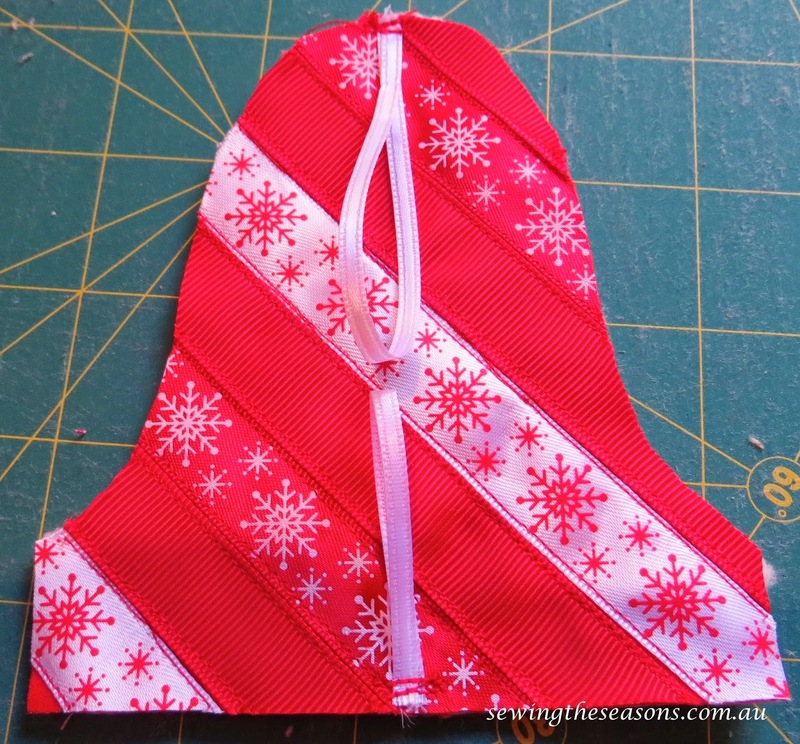 Add button to bottom loop of ribbon. Hang on tree & enjoy. I also use mine instead of gift tags on gifts.